Google's free turn-by-turn navigation for Maps is the news this morning, and even in Beta, they got a lot right. It has Google tech, like Street View and satellite imagery, and even voice-powered search. Here's what you need to know. • What's getting it: It's Android OS 2.0 only for now. And will be available when devices like that ship. (Google demo'd the app to us on a Droid, FWIW.) Other platform support will be announced "by carriers and phone makers" when they're ready, but Google implied they are working closely with Apple now on it. • Traffic handling: The traffic data, as on Google Maps, is driven by multiple sources. Typically, this means data could be from local road authority services like the Bay Area's Caltrans department's highway cameras and services like Inrix, but also from cellphones using Google Maps. • Price: It's free, and there are no ads. There's nothing like it in Apple's App Store that's less than $25 bucks a year. • Turn-by-turn voice: There's only one English-speaking voice at the moment, but it does to text-to-speech, reading street names out loud. • Does it work offline? Sort of. Maps cache along your intended route, so even if your connection dies along the way the route will still show you what you need to see, and text-to-speech voice synthesis of street names still works, too. • Maps that never age: Like most cloud map services, you'll never need to update your map data, but you have to download route maps every time you head out (so you need cell service at the starting point). • Unique views: It has satellite view, which is super cool for context on the street, but also, it has Street View. When you're supposed to turn, Street View images come up, overlaid with arrows. Same thing happens at your final destination. Since Street View images have metadata on direction faced and position, Google Maps Navigation intelligently draws the arrows where you're supposed to go. Sort of. • Traffic UI: The traffic icon is simple—green, yellow and red according to flow of traffic, with your time of arrival next to the symbol. If you click on the traffic icon, the map zooms out to show congestion points along your route. • Multi-destination routing? There's no way to setup multiple stops to help you plan a day's drive to many locations. But you can search for locations (gas, eateries) along your route, and those results will show up on the map as long as they're within a radius that moves long your path. You can also pre-determine your stops, and quickly queue up the next when you reach each destination. • Navigate to point on map: You can tell it to navigate to a location by spotting it on a map and holding your finger down on that point. • OS integration: You can bookmark locations as icons on your Android phone's home page. • Layers? 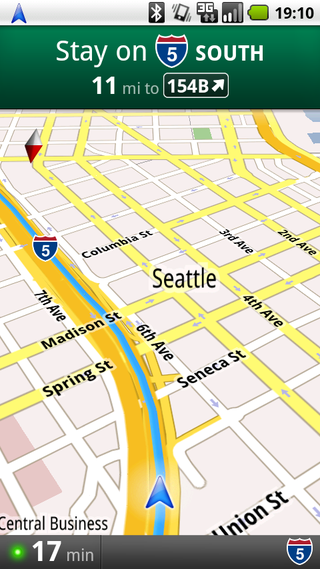 The data on the map, like traffic, satellite view and points of interest, are called layers. Google said it would be easy for them to add more layers, so its ostensibly possible to add things like Google Latitude support, and other neat tricks. Maybe they'll open up an API for it. • Different UIs for different usage cases: There's a landscape and portrait mode, as well as a big-icon UI for dashboard usage. • My fears on zero pricing, for the long term: If Google sells this in the App Store for zero dollars, those millions of bucks Apple makes off of GPS app sales will likely disappear. It's not for us to worry about until there's no more GPS competition except Google, and we're dependent on their pace of progress, but no competition is a bad thing. And it's a little strange that Google's search money is going to pay for a free map app that is competitive with stuff that costs $100 a year from full-time GPS makers like TomTom. Unfair is the word that comes to mind. But I can't say I don't want this app.